Representation is so important, I can’t stress that enough. I’m so here for all the black men and women doing big things for the black community. Opening doors for more black people to express themselves. Showing the world that there’s so much more to black people and black culture, than the negative images that the media loves to put out. It’s amazing how much we’ve been able to accomplish in terms of being seen and heard more, there’s a whole lot more to be done but the journey so far has been inspiring. I don’t think you can really define blackness and what it means to be black. We are all so different and that’s something I have come to really appreciate and love. I was listening to the Talkin’ Plenty Podcast (shout out to you guys) and Nii mentioned that there’s not enough black people in control of what is shown in the media. Which leads to people putting the Chicken Connoisseur and Corville Cuffy the guy who was recorded dancing to the BBC theme tune on the news. These two have had a tones of people watch their videos, which is great. They’re talented, there’s no doubt about that. However like Nii mentioned in the podcast, the BBC & ITV news audience is going to be predominately white. So you can imagine if this is the only thing that a non-black person sees, then they create an image of black people in their head. Which is probably going to be the stereotypical black person who loves chicken and break dancing. Even though this makes me feel some type of way, I’m definitely not shaming Corville and the Chicken Connoisseur for their videos or for accepting to go into the news. Myself and many others are aware of the media putting out specific images of black people, In order to keep us at a certain level. Unfortunately there’s just not enough people rooting for the more positive and non-stereotypical black people. But saying that I’m aware of responsibility politics and I don’t feel as if black people should pretend to be someone their not in order to better the community. Have a listen to the Talkin’ Plenty Podcast latest episode. They address mental health and also representation in a great way. I like how it’s not all one sided, it’s a good discussion. 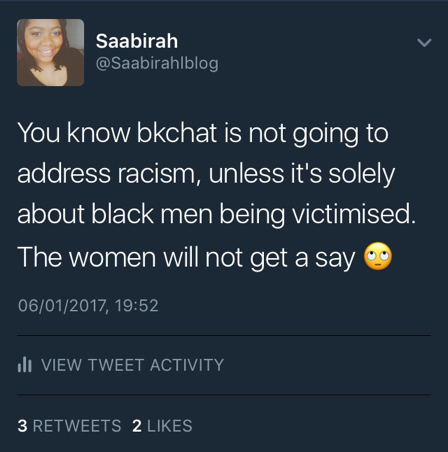 I’m constantly looking for new people to watch on youtube, especially black British folk, so I quickly jumped on the bkchat train. I have continued to watch the BkChatLDN episodes, even though I have several issues with the topics they discuss and cast members views. I constantly get myself worked up watching their videos, mainly because I just can’t get my head around these grown twenty somethings talking about body count and who pays on the first date – At your big age? I will admit that BKCHATLDN is one of my guilty pleasures, or maybe I just enjoy the feeling of rage….who knows. Anywho, I can’t ignore the fact that this show trends on twitter EVERY time they post a video. I started to think that there huge number of views and subscribers, just goes to show much we crave and love seeing people who look and sound like us. At first I was just straight up angry, but then I realised that there’s a reason why so many people tune into their videos and why their views continue to grow. I don’t personally care about body count (mainly because women are taught not to care about how many sexual partners men have), but obviously a lot of people do care and feel as if it is a conversation that must be had. People are constantly saying that the cast should be changed and replaced by woke/conscious people. I totally get why they’d say that, however I think there only needs to be one or two, just to check anybody that says anything problematic. I’d be a lot more comfortable if they had someone who would call out Lucas’s abusive and sexist comments. I’d be happier if someone would also tell Esther that it’s okay to want a man who is in control, but verbal and emotional abuse is not goals. Oh and someone tell Lucas that he does not respect women and he is indeed a misogynist, thankyou. Also the guys over on the TwoFoolsTalking Podcast discussed the representation in theatre. Representation in all places is important, the more spaces we see ourselves in, the more spaces we can get involved in. So definitely have a listen to them if you’re interested in theatre or the performing arts world and also if you just want to have a laugh.